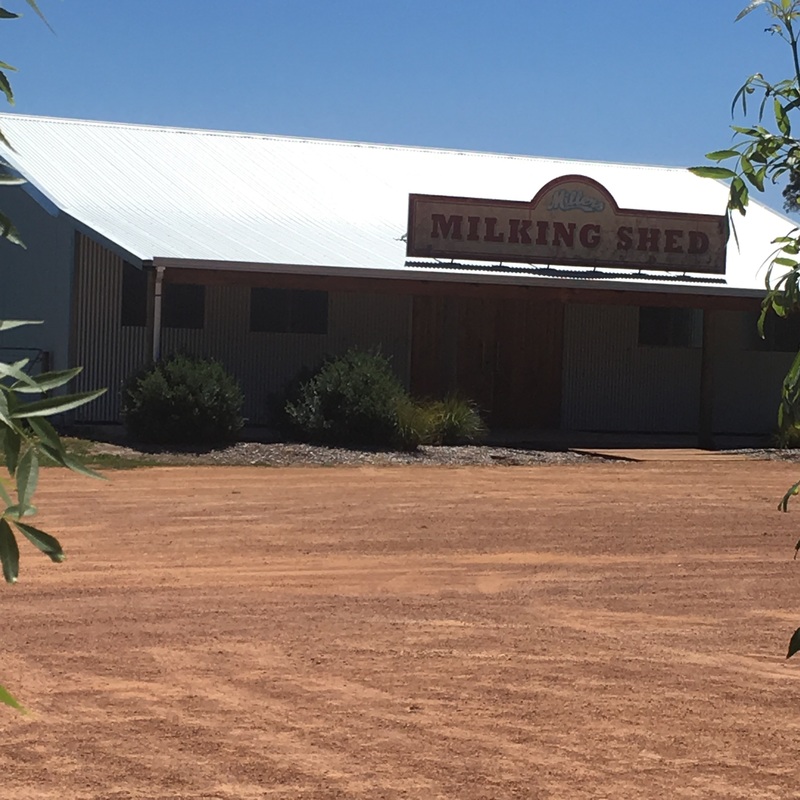 The Miller Family have been involved in dairy farming in Cowaramup, Margaret River, ever since the early 1930s. The family tradition started in 1932 when Sandy Miller immigrated to Australia from Scotland when he was 19-years-old. He married a woman named Joy and secured some land near Cowaramup and established a dairy farm. He bought himself a small herd of cows and would milk them by hand day and night. His product back then was cream. He would make it himself and take it into town on his horse and cart and then send it to Perth on the train. In the 1960's, Sandy's farm was inherited by his son Don. Don and his wife Dossy modernised the farm, bought more cows and began producing vast amounts of milk. In the 1990s, the farm was inherited by Paul Miller and his wife Trish. Paul decided to switch to making ice cream and thus Millers Ice Cream was born. Millers Ice Cream Farm and Café opened on December 27, 2010. The farm prides itself on making ice cream from cow to cone. The farm has a herd of over 150 cows who are machine milked twice daily at 5am and 3pm. 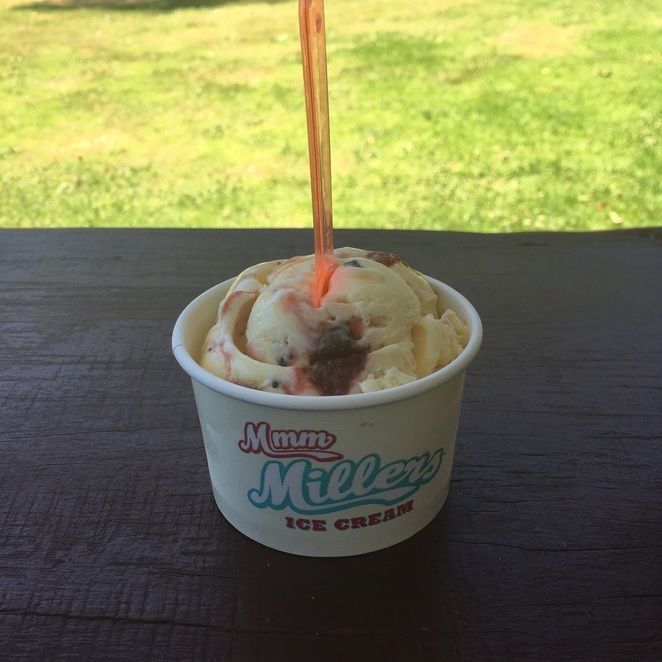 The cows produce creamy, hormone-free, un-homogenised fresh milk that is then pasteurised and used to make Miller's award-winning delicious ice cream. Millers Ice Cream has become a booming business since they opened their doors in 2010. In addition to their farm and cafe, they also have retail shops in Margaret River and Rockingham and an ice cream cart available to rent for private functions. The farm and café is open daily from 10am to 4.30pm. It is closed on Christmas Day, Boxing Day and Good Friday, and every winter from the 17th to the 31st of August and it might close in bad weather. Please check their Facebook page before visiting. The Farm café serves pastries, scones, savoury snacks, tea and coffee, hot chocolate, iced coffee, and glasses of farm fresh milk. 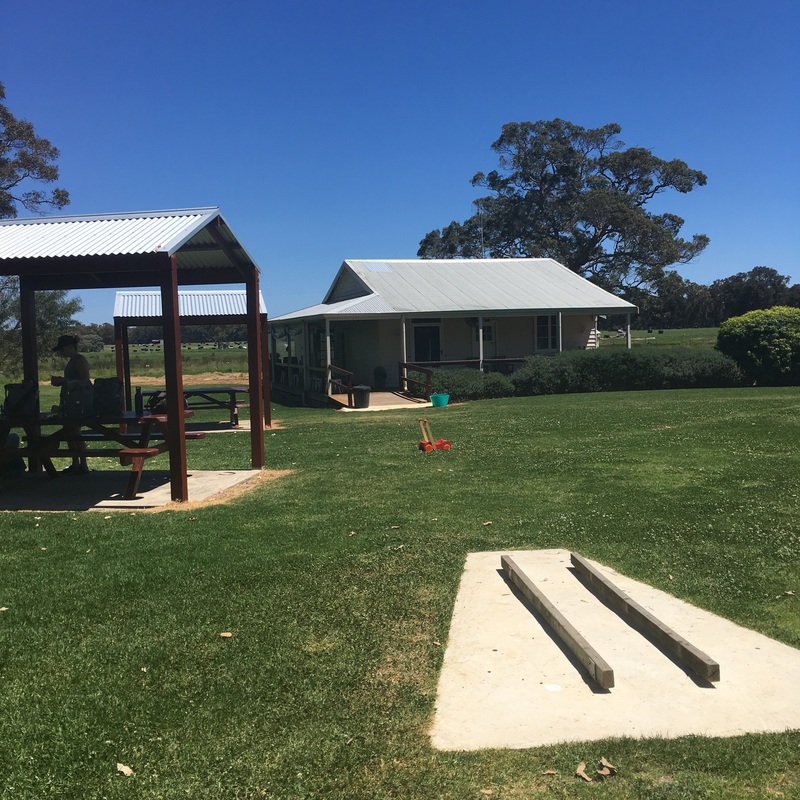 They have toilets (including disabled), baby changing facilities, a wooden deck and veranda with outdoor seating, and disabled access to the gift shop, milking shed and a large outdoor grassed area. 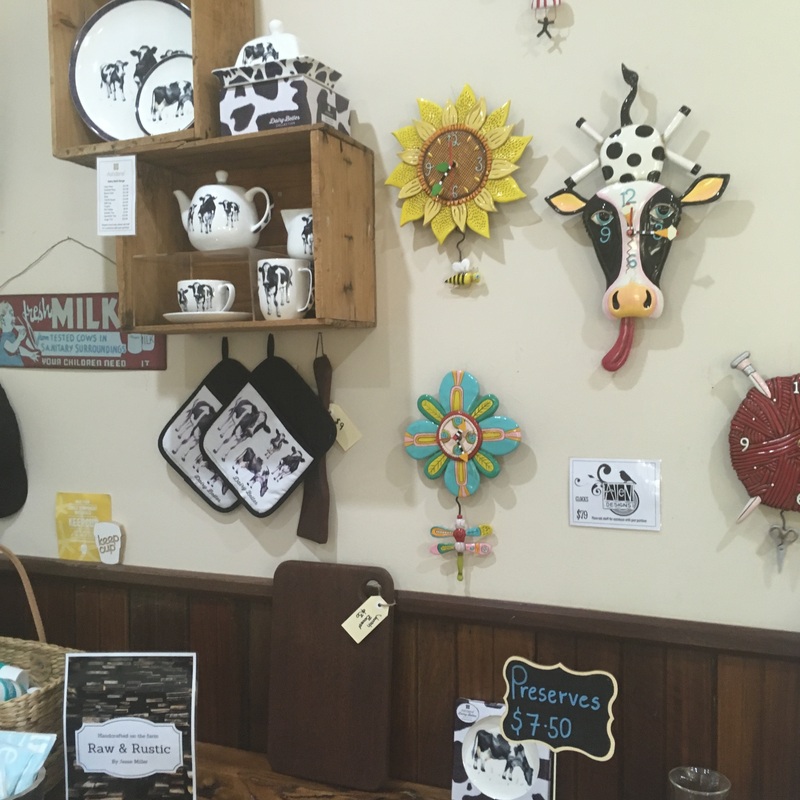 The gift shop sells cow themed gifts and wacky knick-knacks, Millers Ice Cream souvenirs like hats and caps and locally handmade crafts and preserves. 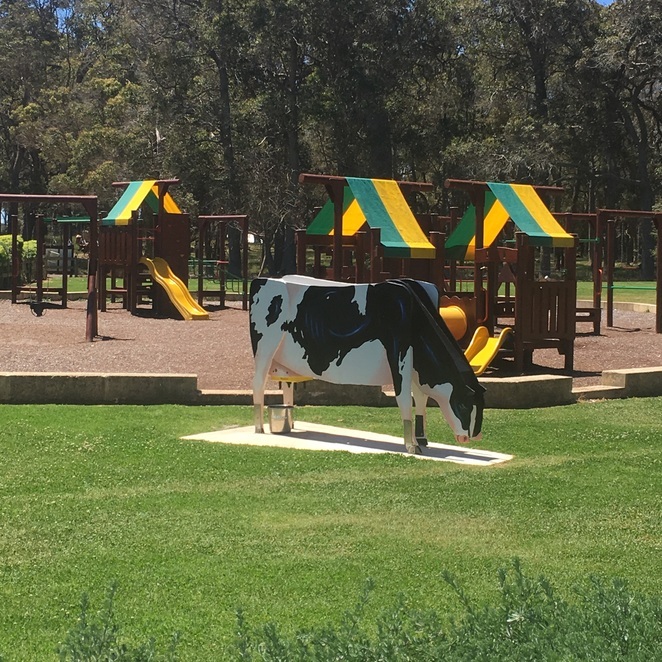 Millers Ice Cream Farm and Café also has a huge Adventure Playground, a large grassy area for kids to run around on, picnic tables and gazebos, and even dummy cows that the kids can have a go at milking. Millers have created over 60 different flavours of ice cream since they started operating. The café has a whopping 26 flavours on offer every single day. There is a full list of all of the flavours available on their website. 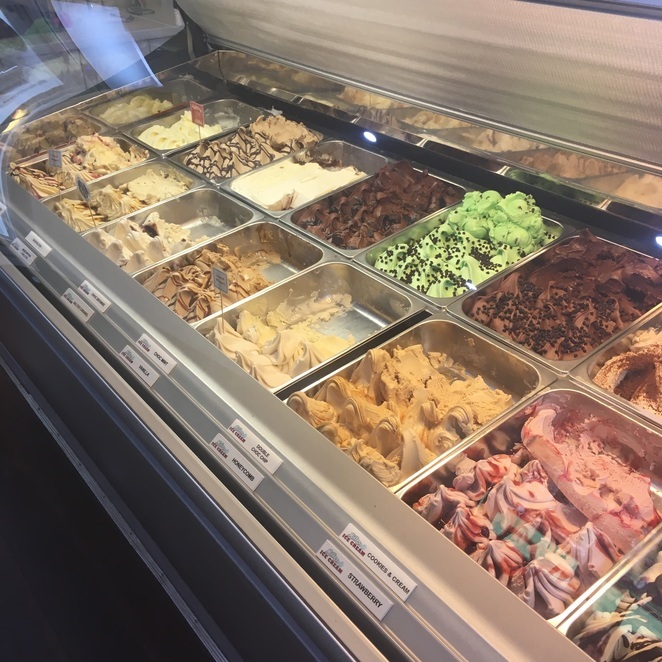 Apple Pie, Banana Choc, Black Forrest, Blood Orange Sorbet, Coffee Ginger and Custard and Strawberry are just some of the flavours they have invented. There are so many delicious choices! The farm has a Milking Shed that holds daily live milking demonstrations. The kids will be able to meet a cow and watch her get milked the traditional way by hand. There are also baby calves that need bottle feeding and you will be able to learn a little bit about milk production and life on a dairy farm. Summer shows are being held daily at 11am and will continue until Sunday the 28th of January 2018. You can purchase ticket prices for live milking demonstrations from the Farm Café. Click here for information about ticket pricing and group bookings. Millers Ice Cream Farm and Café was a fun place to visit. I liked the dummy cows outside and the cow-themed gift shop. The playground is huge and has lots of slides and climbing equipment. The grounds are clean and well-kept and there was plenty of seating available. I was impressed with the range of ice cream on offer and really enjoyed the scoop of strawberries and cream that I got. 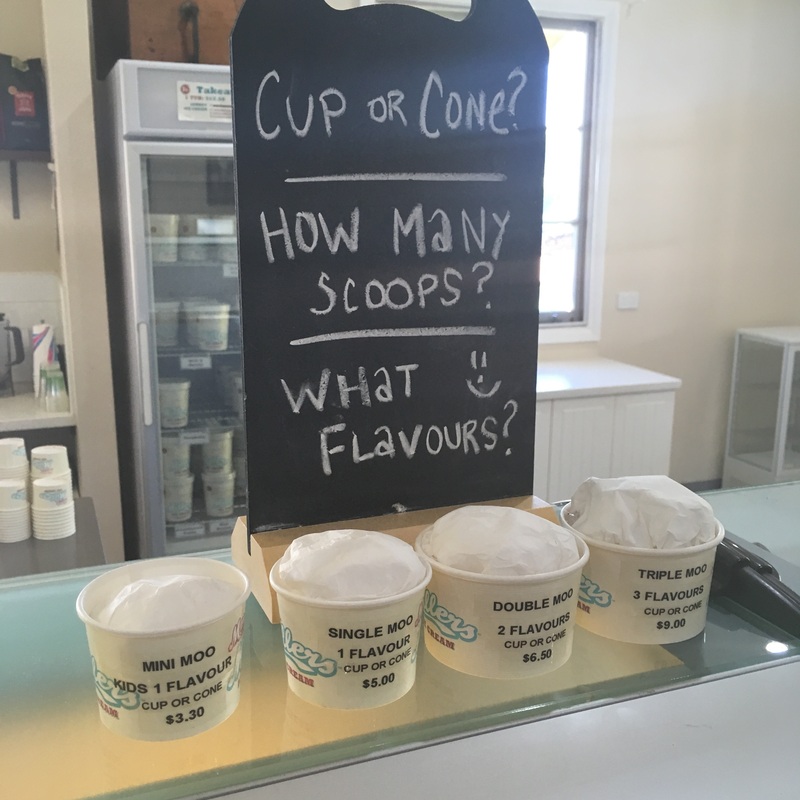 If you're planning on visiting the Margaret River area you should definitely give Millers Ice Cream Farm and Café a visit. Their ice cream is superb and not to be missed. When: Open daily from 10am to 4.30pm, closed on Christmas Day, Boxing Day and Good Friday, they are closed every winter from the 17th to the 31st of August and may close during nasty weather. Please check their Facebook Page for details. Sounds like it makes getting ice cream a special experience.